Three days after undergoing a 2nd bladder scan and being given some positive results (slight reduction in the tumour) Finlay has taken a turn for the worst. He’s not eaten properly for a couple of days, is very lethargic and has had a couple of incontinence lapses in his bed. Yesterday he was taken to the vets as his temperature was high. At the Vets it was even higher and concernwas expressed because the Metacam he’d been given in the morning should have been having some effect – what would it have been if he’d not had the Metacam! Two injections were given and a request to see Finlay the following morning. Throughout the evening Finlay just slept with very little interruption at all. He was kept cool by sponging his head to release heat. He had to be carried in and out of the house to do his stuff, and continued to sleep solidly until 4am when he woke up and took himself out through the dog-flap. When proper morning came, he was still lethargic and refused food, although he trotted down the drive to the car for the journey to the vets. He wouldn’t come out of the car without encouragement! The pee he did outside the Vets seemed clear of blood. Fin’s temperature had reduced, but because of his not eating, another antiobiotic injection was given and tablets provided for the next 5 days. 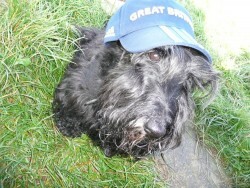 If there is no pronounced improvement over the next 5 days then he must return to the vets. On his return, he was carried into the house and placed in his bed where he slept, unmoving for the next couple of hours. He was awaken and offered a piece of chicken which encouraged him to get out of his bed and eat a little more. He’s now in the garden, but no doubt on his return he will be placed in his bed for a restful afternoon. We’ll keep you informed of his progress. Hi Bill, thanks for dropping by. 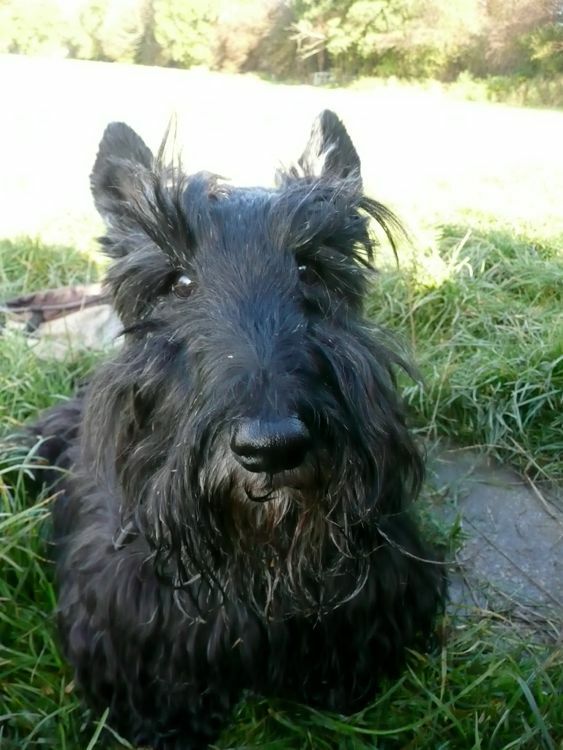 If you’re up to it, perhaps you’d like to share your story of Geordie with us – might help another Scottie family going through the same thing. Let me know and I’ll discuss what to do next. Thanks again. PS: Finlay has shown significant improvement today, thanks for your kind words. Your article can be as long or as short as you like and, if you have any photos that would be great too. We look forward to this, but only when you are ready – thanks again for your support.